To blow off a few Christmas cobwebs and reduce surplus lard, I went with a group of hairy-arsed military types to Jabal Akhdar to walk trekking paths W25 and W24a from Wukan to Hadash. We left the small car park in Wukan at 08.15 to climb for about three hours to the top of Jabal Akhdar at 2,300m. The weather was quite superb – clear blue sky and cool temperatures bordering on the distinctly nippy. After a quick sandwich we descended to Hadash along W24a. The walk took about five-and-a-quarter-hours. Our car had been driven to Hadash by equally hairy-bottomed colleagues who were doing a spot of mountaineering in the area. We drove back along Wadi Mistrall in Land Cruiser comfort to Muscat where we filled up on a magnificent lasagne. Now that’s what the Ministry of Tourism should be promoting (the walk, not lasagne). P.S. 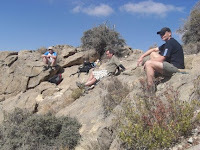 For details of this and other official treking routes see the following publications: Oman Trekking, Oman Off-Road or Adventure Trekking in Oman. The MoT do indeed promote these walks, with glossy little pamphlets, signs, the markers you'd have followed along the way etc. it all adds up to pretty what official bodies publish on walking routes in most of Europe. I guess the issue is that despite all of this, not that many people do these walks. As you point out, the Wakan-Hadash one (and many others) require pre-positioning of cars. And for 8 or 9 months of he year IT'S TOO F'ING HOT! !